There is no doubting that desserts are hot right now. One of the biggest trends to emerge in the liquor industry this year is the rise of dessert flavored spirits. That sweet tooth craving can now be met in the form of new liquor products with flavors spanning whipped cream, chocolate, cake, frosting, honey, cotton candy, cupcake... has your mouth started watering yet? Looking for a new beverage that maintains the same sweet spot as dessert flavored vodka, but lacks the punch of higher-proof spirits? Enter Caramel Apple Liqueur, a new, permanent and unique flavor addition to the already successful line of liqueurs from Hiram Walker(R). The new flavor was launched nationwide in early September and has already made a splash with consumers looking to make cool weather and dessert-oriented cocktails. 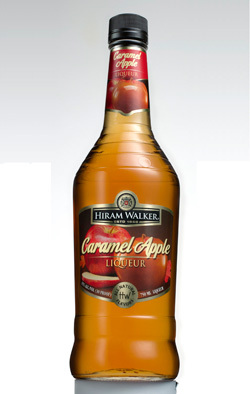 Caramel Apple was a natural selection for Hiram Walker's newest product launch; according to market research, Apple has been the number one-selling flavored martini since 2008 and Caramel is the #2 "indulgence" flavor after chocolate. The innovation team at Hiram Walker truly did a tremendous job with this liqueur. Upon opening the bottle, the smell of rich caramel permeates the nose with the subtlety of crisp apple and all natural vanilla, too. On its own, the liquid is rich, but not cloying sweet as some may automatically assume with a liqueur of this variety. Rather, the two crave-worthy autumnal flavors of caramel and apple combine in a mild, 30-proof liqueur that proves a match made in heaven for shots, flavored cocktails, Hot Toddies, dessert drinks, Spiked Milkshakes - truly, the list goes on! Unique flavors are needed to meet consumer demand and there are a multitude of uses for Caramel Apple behind the bar. Bar None Drinks has a varied collection of drinks for mixing available here. Give one of these recipes a try, or experiment with the liqueur yourself and enter your own recipe into Hiram Walker's fall cocktail contest "The Quest" for a chance to win an Apple iPad! Submissions will be accepted until October 31, 2011. To learn more about Hiram Walker or enter The Quest, visit the brand on the web or become a fan on Facebook.